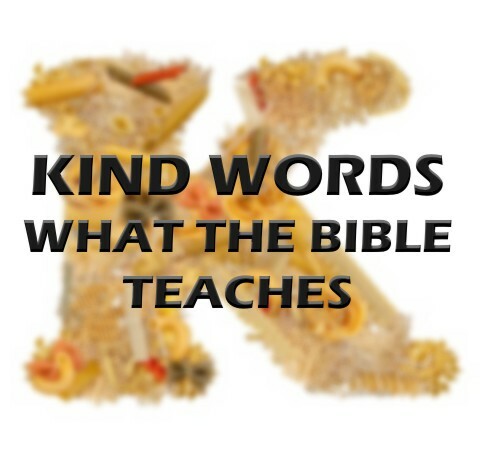 What Does The Bible Teach About Kind Words? Human nature in itself has a constant rebellion towards God. We sin against Him daily and we fail Him time and time again. We have a drive to do things our own way instead of His way. We like being in control and disregarding His plans for us. With all of this said, it is very easy to get caught up in “me”. The more we focus on ourselves the more we forget about others’ needs. And ultimately this can end up in saying some things we will regret later. The more we focus on Him, the more we stop “me” and start helping others. This can bring kindness and compassion into someone’s life and memories to cherish for a lifetime. Sometimes it only takes one thoughtful thing to change a person’s day for the better. So, what does the Bible say about kind words? Let’s dive in and see what it says! Honestly this sounds like a common sense verse, but how often are you and I applying it? It makes sense that saying kind things will give grace to those who hear. But what about that guy who just cut you off on the highway and almost made you wreck? Do you always forgive and move on or do you maybe let out a little curse word to let him know your angry? Human nature wants to put that guy in his place but God says no to do that! In order to live a life that speaks joy to others we have to prepare daily in the Word and prayer, asking God to lead us and to be His voice to others when we speak. Only then will it be a natural reaction to be gentle and kind to those who wrong us. What Do Kind Words Do? Kind words can help heal a broken spirit. An encouraging word can spark that fire in a person’s heart again. Think about how wonderful you’ve felt when someone has comforted you in a hard time of life. Those words of love and loyalty have held me up in my darkest times. So many times I’ve wanted to throw in the towel, but God in His perfect timing has always sent someone to encourage me and say kind things to me to keep me motivated and on track. That is why we are a body of believers. We need each other. That is how we were created. To fuel the fire of anger all you need to do is be harsh with someone and they will become hostile. Negativity towards another person will spur on their rage. However, the opposite is also true. The cure for anger is a soft, gentle, kind word to someone. When you listen to someone and validate their feelings, that fire of anger will die inside of them. People usually just need someone to listen to them and their anger will diminish some if not completely. So, if someone is angry with you, stay calm, be kind, and let the Lord lead. A fool is someone who encourages negativity. A fool is driven by confrontation. A fool wants to destroy your spirit with angry, hurtful things. And a fool is very easy to spot. They are closed minded and often times loud. I once read a quote that said, “The problem with closed-minded people is that their mouths are always open.” 2 Timothy 3:1-5 describes the attributes of foolish people. Some of these include: proud, arrogant and abusive. The end of this section says, “Avoid such people.” Whenever possible we should avoid those who love to hurt others in any way, including hurtful words. The consequence of our words is pretty clear. When we are kind to others, we help them to get over their anger. When we say hurtful things to others, we only escalate their anger that is present. As the song says, “Words can build us up. Words can break us down. Start a fire in our hearts or put it out.” (Words, Hawk Nelson) So as we walk this journey of faith let’s continue to love the unlovable and give grace to those who hate us or wrong us. May God bless you as you continue to live a life worthy of the calling! Derek, I really enjoy reading your articles. They make me want to be a better person and also soothe my heart.